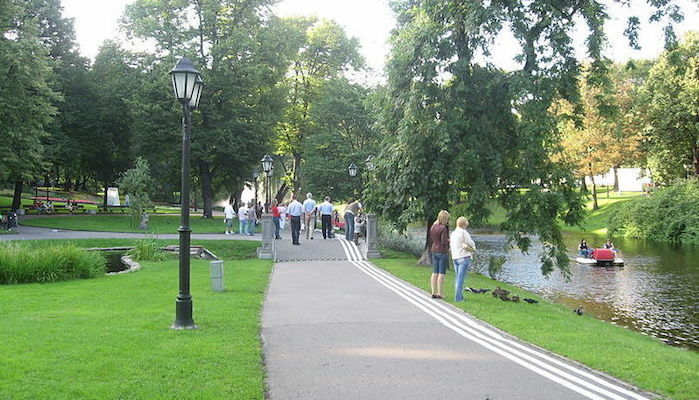 parks which are widely considered some of the best running in Riga. To the north is Kronvalda Park, a nearly 12 hectare landscape with rose gardens and fountains. 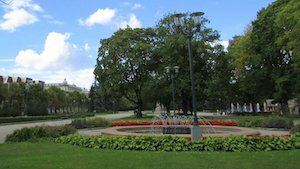 South of Kronvalda, on the east bank of the river, is Esplanade Park, a collection of shady paths and sunny lawns and location of the Latvian National Art Museum. The Just across the street, it connects to the tranquil grounds of Vērmane Garden. From here, runners can connect to the south end of the canal at Bastejkalns Park, where beautiful paths wind northward along the water back to Kronvalda Park. The loop is 4.4 km. Add-Ons: To add 2-3k, head north along Ausekļa iela to nicely landscaped Park Viesturdārzs, with its arched gateway, sculptures & pond. Or, connect with the riverfront paths to the west.